In our final interview of the Governor General’s special edition of The Chat, we speak to JonArno Lawson and Sydney Smith, joint winners of the 2015 English-language Governor General’s Award for Children’s Literature (Illustrated), for Sidewalk Flowers. JonArno Lawson is the author of several award-winning books of poetry for children and adults, and is a four-time winner of the Lion and the Unicorn Award for Excellence in North American Poetry. He has been most inspired in his work by his own children, and received a Chalmers Fellowship Award in 2007 to research children’s lap and bouncing rhymes cross-culturally in different communities across Toronto. Born in Hamilton, Ontario and raised nearby in Dundas, JonArno Lawson now lives in Toronto. Sydney Smith discovered his love of children’s illustration while studying drawing and printmaking at NSCAD University in Halifax. Some of his first experiences illustrating children’s books were for the new editions of Sheree Fitch’s older books (Mabel Murple, There Were Monkeys in My Kitchen, and Toes in My Nose). Originally from Halifax, Sydney Smith currently lives in Toronto. 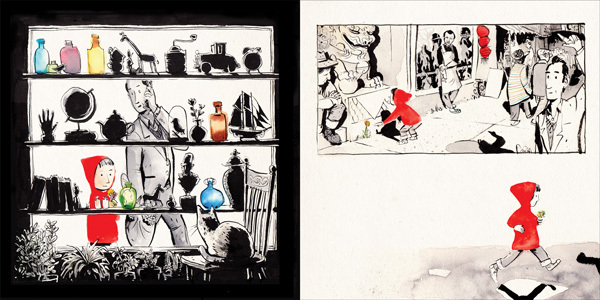 We'll start with two interior spreads from Sidewalk Flowers to provide context for the interview to follow. Outline: A little girl (4–6 years old) accompanied by her distracted, rushing father (he could be hailing a cab, which doesn’t materialize, or talking on a cellphone, or stopping to look at headlines in a paper box, or negotiating pedestrian traffic), sees a flower in a crack of the sidewalk. Oblivious to her rushing father, or only as aware of him as she needs to be, she squats down to pick the little flower. Thank you to Groundwood Books for permission to use these images. Carmela Ciuraru, reviewing Sidewalk Flowers in the New York Times, said, “I’d give this book to anyone with a coffee table, in a household with or without children.” Why might Sidewalk Flowers strike a chord with adults as much as children? JonArno Lawson: I’m guessing it’s because the father is the second-most important character, and he’s not paying attention to his daughter. He’s on his cell phone, he’s distracted, he’s rushing, and most adults recognize this state of being (most kids recognize their parents in this, too). But he doesn’t come across as a bad person—he’s typical—having an adult depicted this way was a gentle reminder to myself (and to anyone else who likes beautifully illustrated reminders) to be wary of slipping into autopilot. “Beautifully illustrated” might be a key to why adults seem to be liking this book too—the pictures have a surprising depth. 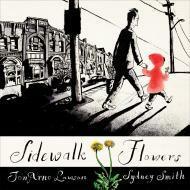 Sydney Smith: Sidewalk Flowers has a way of reminding adults what they miss about childhood and I think that is where its magic lies. I think that children appreciate the sentiment of mindfulness but that they respond as well to other elements and details of the story like the dead bird or the characters of the city. Colour—and its absence—is an important element of Sidewalk Flowers. How does it play into the overall themes of the book? JL: For me, this came from directly observing the grey cement streets and sidewalks and embankments along Bathurst St. transform into the greater green of the lawns and gardens and Cedarvale Park as we arrived home on Arlington Avenue. It was important to me that this was captured visually in the book, because it was a big part of how the idea for the story evolved. Wherever you live in the world, there tends to be a time of drought, or of winter, where the natural world loses its colour, and there’s a great sense of relief when better weather returns, and with it, colour and diversity. We would have been noticing that and longing for that in a prehuman state too—long before we had words to describe it—it’s part of our biological hardwiring. And therefore (I think) part of our psychology. The story reflects how we have to look more carefully for what there is to gather in bleaker times, and when things become more abundant for us, we (at our best) become more keenly aware of the needs of others, and that’s it’s important to redistribute whatever it is we’ve gathered. We always need a little for ourselves to keep going, but most of what we gather can be redistributed again. SS: The choice to start the story in black and white was a brilliant idea by JonArno and Sheila Barry. The red coat, the only presence of colour, is like a flame the girl carries. As colours are released through the book, sometimes it's a direct result of her sharing her flowers and at other times it's just an object that catches the eye. Like small flowers that grow in the city, they are present but may easily be passed by. The book is both timeless in its beauty and timely in its observation of how much more distracted we adults are these days. Is this culture of distraction something you both try to resist in your own lives? If so, how? JL: We are living in a very distracted culture. My kids help me keep my priorities straight. I want them to have time to think, and to talk, and to make things and make things up. And so I need to do that for myself, too—you have to live the way you want your kids to live. If you’re pessimistic and impatient and bad tempered, they’ll learn from those habits, and they’re really just habits. If I’m playful and available and interested they’ll learn from that just as easily. Forget about what they learn from me—in reality I had to relearn a lot of that from them! I fail at all of this sometimes, of course, but that doesn’t stop me from succeeding at other times, and that’s the point. Don’t give up on yourself—it takes time. Think about what you want to look back on at the end of your life, and then re-make yourself accordingly. You have to live the way you want your kids to live. If you’re pessimistic and impatient and bad tempered, they’ll learn from those habits, and they’re really just habits. If I’m playful and available and interested they’ll learn from that just as easily. SS: It’s true. I get distracted easily and sometimes I have to purposely leave the studio or home without a device. I try to carry a sketchbook with me at all times. When I sit and draw street life I feel present. And it's not about making a pretty drawing. When you draw something you connect to it, and project a bit of yourself into the subject. That's the easiest way I become present and grounded. 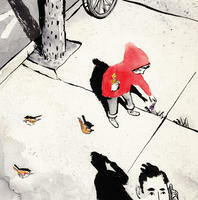 Sidewalk Flowers is a wordless book, yet it involved a written story to inspire the illustrations. 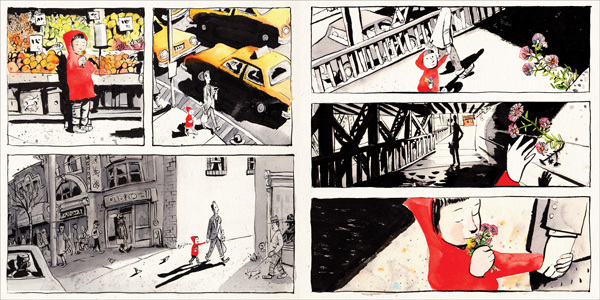 Why the decision to ultimately make it wordless? What did the writing/illustration collaboration look like? JL: The story came to me as a wordless story. Really it was just observing what was happening over the course of a walk with my daughter, and then watching what happened when we got home. There are a few fictional additions to the story, but essentially the story happened as you see it, and it happened without any talking (my daughter did some singing though), and I felt it had to stay that way—that words would take away from it, they couldn’t add anything. I gave Sheila Barry a written structure for the book: a plot, with a setting, and a series of details and happenings for each spread. Sheila made some important suggestions. And when that was done, Sydney was given a great deal of freedom to create the mood and set the pace, appearance and perspective of the spreads. He added a lot of his own ideas in the details too—it was a collaboration in every sense, though Sydney and I didn’t meet till the book was almost done. These are the storyboard notes Sydney worked from, below. He also knew the story took place between Bathurst and Dupont—the setting of certain plot points along the way (the railway underpass, the embankment by Hillcrest school) so he sketched along that stretch of Bathurst. SS: I was given an outline and a general page count but there was nothing set in stone. I was introduced to JonArno after I was finished the book and I was extremely relieved and excited that he and I had such similar goals with the project. The fact that the book is wordless changes it from a story being told to you into a story that you are a part of. The fact that the book is wordless changes it from a story being told to you into a story that you are a part of. Also, the silence encourages the same theme of awareness and presence. Like the father, we aren't inserting ourselves into the game the girl plays and we aren't congratulating ourselves for our own generosity. The girl doesn't care if anyone sees what she's doing and when there are no words to announce her generosity and compassion it makes it more authentic and pure. The little girl in Sidewalk Flowers gives flowers to various people and animals as she walks along. Is there a particular flower gift that means the most to you? Why? SS: The most common of all flowers are the most precious to me. 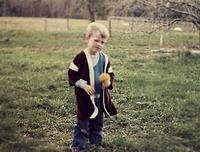 My earliest memories are of picking dandelions for my mother. I can still taste the bitter dandelion milk that would get on my hands. They would wilt within the hour but it didn't matter, I would already be back outside to pick more. Thanks for Groundwood Books for permission for the spread and illustrations.